Mumbai: Are things finally looking up for the Indian telecom industry? After arbitrary regulation and over-competition almost bought it to the deathbed, it seems that the government is finally taking steps to cleanse the system. According to a The Times of India report, the Telecom Commission has directed the Department of Telecom to prepare an exit policy. That will allow weaker operators to either surrender their licenses or sell their operations to other firms. It will give relief to many firms that are bleeding cash. After kick starting operations with much fanfare, many new companies were unable garner enough customers and attain economies of scale. The development on the exit policy front comes when the government is in the midst of formulating New Telecom Policy 2011. After more than a year of regulatory uncertainty, we believe the sector will see regulatory clarity by year-end. We don’t expect the outcome of the regulatory policy to be unilaterally positive but we expect clarity/stability to be well received. Telcos remain exposed to fines for excess spectrum. Meanwhile, the tariff hikes have bought good tidings for the telecom stocks. On 22 July Bharti Airtel announced a 20% hike in call charges. Other telecom operators - Vodafone and Reliance Communications followed the suit and increased the tariffs. 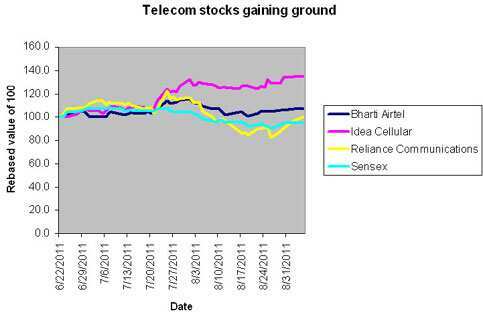 That revived the investor interest in telecom stocks, some of which have outperformed the broader markets since. The recent tariff hike is likely to lead to a CAGR of up to 12% in the EBITDA per minute over FY12-FY14. This rise is despite the likely increase in costs per minute. Robust operating cash flows, driven by improved profitability, are likely to support the higher funding needs for capex and regulatory levies…………………Higher valuations are likely to sustain due to the improving outlook on EBITDA growth. Even though some policy changes are expected to cost some companies’ dearly (like charging for excess spectrum), overall, the guidelines are expected to bring-in the much-required stability and clarity in regulations.